to submit your macro to Macroland. 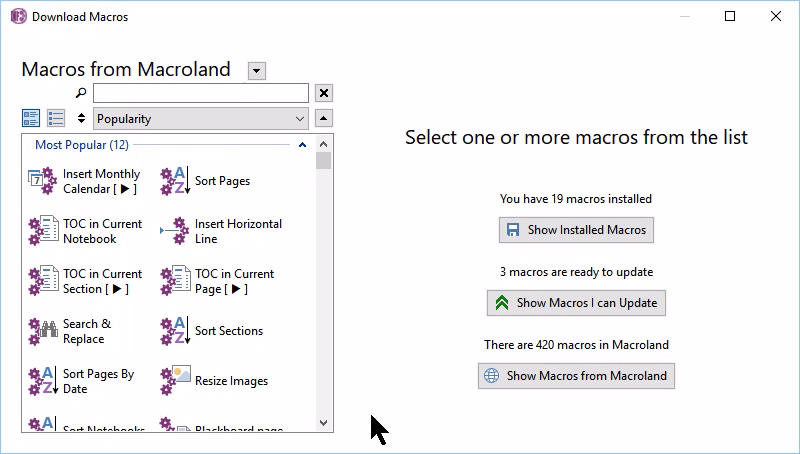 Macro Editor will directly communicate with the Onetastic website to upload your macro instead of taking you to a browser page. You can enter your user information in the editor and if you have an active Onetastic license, it will use your credentials from the license directly instead of asking for user information. This will streamline the macro upload experience by reducing steps to submit your macro. Try this on your next macro submission. The old web based macro upload is now removed so upgrading to the latest version of Onetastic is required for future macro submissions. You can now view videos of macros from the Download Macros window. Macros that have videos will have the video icon [ ▶ ] in their names. This will help understand what a macro does before downloading it. You can now switch to a list view in Download Macros window. This allows seeing long macro names easier. Converts selected pasted "Copied Paths" into file hyperlinks. This provides similar functionality now removed from OneNote that allowed files copied from windows explorer to be pasted as hyperlinks. I am looking for a way change the spacing before, after and in between paragraphs. Most often, I'd like to reset the paragraph spacing to 0 - 0 - 0, esp. after pasting content from other sources (eg. Websites, other documents) into ON 2010. Unfortunately, the "Clear Formatting" button in the "Basic Text" ribbon does not reset the paragraph spacing (and probably shouldn't). Your "Insert Space Between Paragraphs" macro only adds an empty line, but doesn't change the paragraph spacing at all. read/write, so that I could change those back to e.g. 0 before - 0 after - 0 min spacing? Do you also have a macro equivalent to the "Clear Formatting" button that could be added to such above macro? It is important that hyperlinks from the pasted text won't be broken, though, as happens with the "Remove Paragraph Breaks" macro. Thanks a bunch for all your great work! This macro used to work OK on this page, and still works fine on all other pages. I have tried recreating the page, both by copying the page and cutting and pasting. On a duplicate page I deleted parts and it began to work again, but on trying to hone down the problematic area it became clear it was not consistent - sometimes it would work with lines in that before gave the error. So I am stumped. Any ideas much appreciated. All I really want to do is avoid having this error I am not bothered about debugging it as it appears to be a one off. 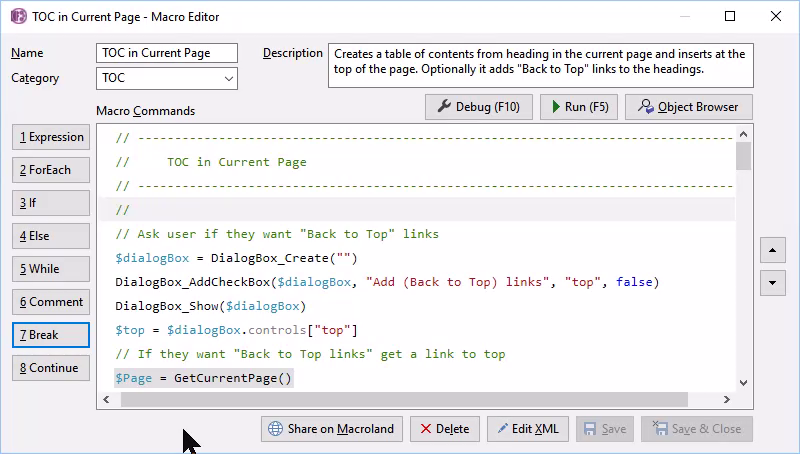 Do you know of a way to display unchecked to do items (or flagged) within the TOC hierarchy? For example, For X project, these are the next steps that need being done. Downloaded Onetastic for custom "styles", however it crashes OneNote 2016 64bit, whenever I try to apply a custom style. It does save custom styles, but will not apply them. Dear Omer: Hope all is well. is there a simple macro to "merge" two (2) Onenote notebooks? if not, could you please send me a link to how to do it? Thanks. Happy New Year. Simon Rear: I can add it if you can provide a 800x600, ideally 10 fps, less than 1 minute and no audio supported. Thanks for the update Omer. Quick question is it possible to display macro videos when I upload macros? (like the macros that have the play button near them after this update). Many thanks Omer. I was unaware that you can "convert" a page or section into Word. Much appreciated. Hi Omer, Thank you for your prompt response. You are right, it hasn't updated. My version number is Onetastic Pro 3.8.0. Also my licence has expired. Do I need to renew for updates? After Update 3.9.1 the Update Available button is still active. I have updated many times so I am sure I follow the correct procedure, it just seems to be this version repeatedly wants to update yet it is the same version. Greetings Omer: Happy Holidays. I'm wondering if you would recommend Gem for Onenote? Or is it essentially what you do here with macros in Onestatic? I do like the feature of "converting" a page in Onenote into a Word document (is there a macro that does that? ).